Moretti was an interesting automobile marque. The early years were spent on commercial vehicles, motorcycles, and microcars. It wasn’t until after the WWII that things like this came around. Moretti rebodied a great many Fiat – usually becoming more attractive than the car they were based on. Production numbers were never high, but they were always interesting. The 1200S Spyder was a prototype built by Moretti. Two were built, one in 1954 and this one in 1955. This car was on the Moretti stand at the 1955 Turin and Geneva Motor Shows. It is powered by a 1.2-liter straight-four making a mighty 85 horsepower. After the show circuit, the car was sold to the Venezuelan Moretti importer who raced it before selling it to a Ford executive in Venezuela. The new owner took the car to Cuba and attempted to race it but engine issues sidelined him early. He swapped out the engine after the race. When Castro took over, the Moretti and its owner fled the country quickly. The car was discovered in a barn in 1998, sold to a few new owners and was sent to Italy for restoration. The original engine was sought out, still in Cuba where the owner had left it. It was put back to factory specification and debuted at the 2004 Pebble Beach Concours. It is one of two and could bring between $750,000-$950,000. Click here for more info and here for more from this sale. 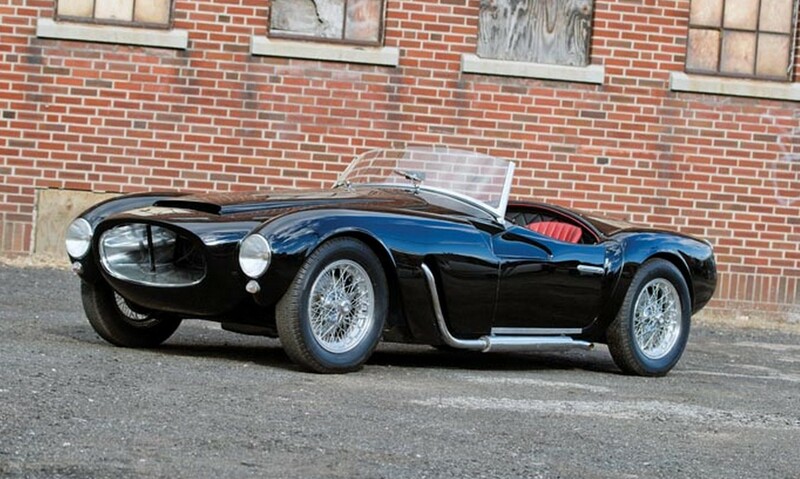 This entry was posted in Uncategorized and tagged 1200s, 1955, auctions, cars, classic cars, moretti, worldwide auctioneers by classiccarweekly. Bookmark the permalink.